Most of the top 20 cryptocurrencies reported solid increases, with the bitcoin releasing $ 3,450 again. 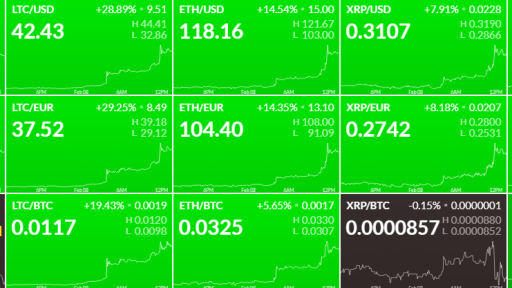 The biggest cryptocurrencies is an 8.10% increase today, trading around $ 3,683. Bitcoin is set to end a week with the formation of a key price action signal. The 200 weekly MA in the role of dynamic support successfully passed the bear test, forming a strong engulfing bullish bar. In such a scenario at the end of the session, it is possible to look for long positions after a 30% bar correction. Top Altcoin- Ripple, wins over 7% over the past 24 hours, currently trading around $ 0.31. The price is directed to the 50-MA on a daily chart. I'm expecting a test next week. At the level, the downward trend will continue and there will be a repeat attempt to form a deeper bottom. In an alternative scenario, the 50-period break will give early indications that the bulls are awake, which will also lead to a probable 200-period test. Personally I would wait with the long to at least a successful break at the level of 0.3826. Ethereum, the second largest market-based altcoin, trades around $ 119.70, starting at $ 105. If the price has closed successfully over 200 periods, it is possible to look for long positions in the new week after a break test. Among the top 20 by market capitalization cryptocurrencies , Litecoin recorded the biggest increase, currently accounting for more than 30%. LTC went to fourth place in capitalization. The price is approaching 200 MA on daily chart. In the event of a break, we may look for long positions after a confirmation test of a break with a stop below the bottom of the current bar. When repelling, many short positions will accumulate with a stop over the period. In the event of a second level test, if this stack of stops is interfered with, it will be reflected in a strong upward impulse. In an alternative scenario, the bearish trend keeps its strength, and the rise from today is a healthy correction. This great movement was created by the announced partnership between Litecoin and Beam for the implementation of Mimblewimble through Extension Blocks. Mimblewimble is a protocol that is designed to improve the security of cryptocurrencies . Also today news has emerged that the Bitcoin exchange-traded fund (ETF) will most likely receive the approval of the US regulators SEC.